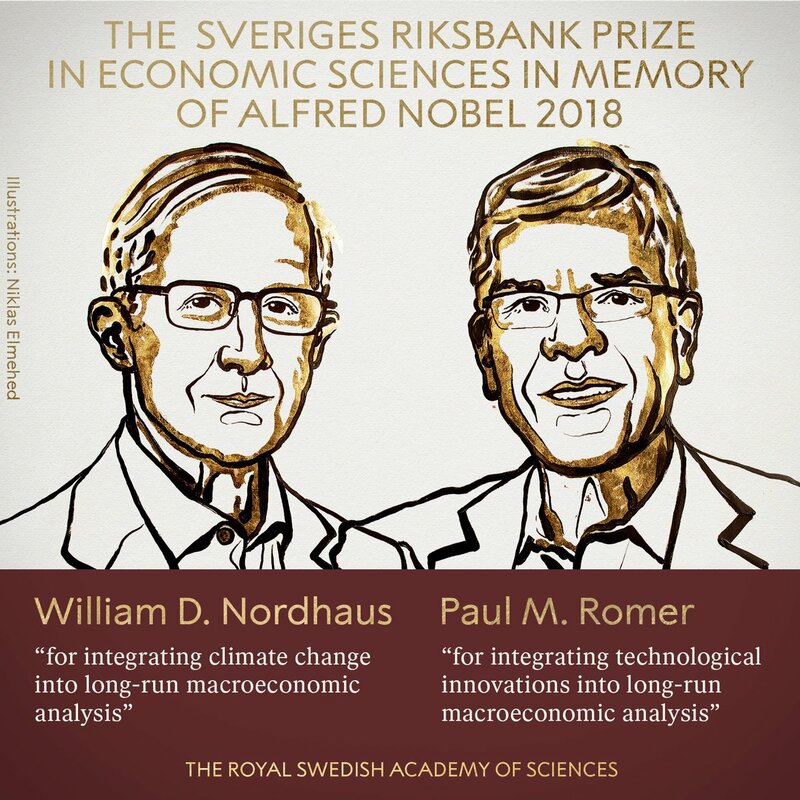 It is both appropriate and Ironic that, on the day that William Nordhaus should get the Riksbank prize (also called Nobel) for his contribution to the economics of climate change, the top scientific body, the Intergovernmental Panel on Climate Change (IPCC), should release its latest update on global warming. The report sets out the key practical differences between the Paris agreement’s two contrasting goals: to limit the increase of human-induced global warming to well below 2℃, and to “pursue efforts” to limit warming to 1.5℃. The IPCC says that if we are to limit warming to 1.5℃, we must reduce carbon dioxide emissions by 45% by 2030, reaching near-zero by around 2050. Whether we are successful primarily depends on the rate at which government and non-state bodies take action to reduce emissions. Yet despite the urgency, current national pledges under the Paris Agreement are not enough to remain within a 3℃ temperature limit, let alone 1.5℃. Rapid action is essential and the next ten years will be crucial. In 2017, global warming breached 1℃. If the planet continues to warm at the current rate of 0.2℃ per decade, we will reach 1.5℃ of warming around 2040. At current emissions rates, within the next 10 to 14 years there is a 2/3 chance we will have used up our entire carbon budget for keeping to 1.5C. Global emissions of carbon dioxide, methane and other greenhouse gases need to reach net zero globally by around 2050. By 2050, 70-85% of electricity globally will need to be supplied by renewables. Investment in low-carbon and energy-efficient technologies will need to double, whereas investment in fossil-fuel extraction will need to decrease by around a quarter. Although the Paris Agreement aims to hold global warming as close to 1.5℃ as possible, that doesn’t mean it is a “safe” level. Communities and ecosystems around the world have already suffered significant impacts from the 1℃ of warming so far, and the effects at 1.5℃ will be harsher still. Poverty and disadvantages will increase as temperatures rise to 1.5℃. Small island states, deltas and low-lying coasts are particularly vulnerable, with increased risk of flooding, and threats to freshwater supplies, infrastructure, and livelihoods. This is where William Nordhaus, a professor of economics at Yale University, comes in. He pioneered the economic analysis of climate change. He is also a leading proponent of the use of carbon taxation to reduce emissions, a policy approach preferred by many mainstream economists. Nordhaus’ contribution was to develop a model that could supposedly gauge the likely impact on economies from climate change. Nordhaus constructed so-called integrated assessment models (IAMs) to estimate the social cost of carbon (SCC) and evaluate alternative abatement policies. And this is where it becomes ironic. Nordhaus’ IAMs have flaws that make them close to useless as tools for policy analysis. The IPCC pointed out that estimates of losses resulting from a 2 °C increase in mean global temperature above pre-industrial levels ranged from 0.2% to 2% of global gross domestic product. It admitted that the global economic impacts are “difficult to estimate” and that attempts depend on a large number of “disputable” assumptions. Moreover, many estimates do not account for factors such as catastrophic changes and tipping points ie where global warming gets out of control and damages economies much more quickly and deeper than forecast. Most IAMs struggle to incorporate the scale of the scientific risks, such as the thawing of permafrost, release of methane, and other potential tipping points. Furthermore, many of the largest potential impacts are omitted, such as widespread conflict as a result of large-scale human migration to escape the worst-affected areas. Because the IAMs omit so many of the big risks, SCC estimates are often way too low. As the IPCC acknowledged2, published SCC estimates “lie between a few dollars and several hundreds of dollars”. These values often depend crucially on the ‘discounting’ used to translate future costs to current dollars. The high discount rates that predominate essentially assume that benefits to people in the future are much less important than benefits today. These discount rates are central to any discussion. Most current models of climate-change impacts make two flawed assumptions: that people will be much wealthier in the future and that lives in the future are less important than lives now. The former assumption ignores the great risks of severe damage and disruption to livelihoods from climate change. The latter assumption is ‘discrimination by date of birth’. It is a value judgement that is rarely scrutinized, difficult to defend and in conflict with most moral codes. The other role of IAMs — to estimate the costs of climate-change mitigation — also suffers from major shortcomings. The IPCC’s mitigation assessment concluded from its review of IAM outputs that the reduction in emissions needed to provide a 66% chance of achieving the 2°C goal would cut overall global consumption by between 2.9% and 11.4% in 2100. This was measured relative to a ‘business as usual’ scenario. But growth itself can be derailed by climate change from business-as-usual emissions. So the business-as-usual baseline, against which costs of action are measured, conveys a misleading message to policymakers that fossil fuels can be consumed in ever greater quantities without any negative consequences to growth itself. The discount rate used to calculate the likely monetary damage to economies is arbitrary. If we use a 3% discount rate, that means the current rise in global warming would lead to $5trn of economic damage (loss of GDP), but the cost in current money of global warming would be no more than $400bn, about what China spends on hi-speed rail. So, on this discount rate, global warming causes little economic damage and thus the social cost of carbon (SCC) is only about $10/ton, so mitigation action can be limited. This is what Nordhaus uses in his model. But why 3%? Nicholas Stern, of the famous Stern Review on climate change, took Nordhaus’ data and applied a 1.4% discount rate. The SCC then rises to $85/ton – meaning that it costs economies $85 for every ton of Co2, or closer to $3trn now! If you take a median range discount rate on likely damage, the SCC is probably about $50/t. But the current carbon price is about $25/t. So the social cost is not being ‘internalised’ in any market prices. The argument about the discount rate exposes the argument about the future. The IAMs assume that the world economy will have a much larger GDP in 50 years so that even if carbon emissions rise as the IPCC predicts, governments can defer the cost of mitigation to the future. And if you apply stringent carbon abatement measures eg ending all coal production, you might lower growth rates and incomes and so make it more difficult to mitigate in the future. Yes, that is what Nordhaus’ IAMs can lead us to conclude. And IAMs also exclude the feedback – namely that global warming leads to more natural disasters, droughts and floods and thus to massive disruption and migration of affected populations and thus a sharp reduction in GDP growth rates. The world will not be much ‘richer’ in the next generation if global warming goes unchecked. Finally, as with all these neoclassical growth accounting models of which the IAM of Nordhaus is one, there is no allowance for recurring crises of production in capitalism or rising inequality of income and wealth. Growth accounting is the mainstream version of explaining long-term economic growth. Neoclassical theory assumes perfect competition and free markets and it assumes what it should prove that capitalist economic expansion will be harmonious and without crises as long as markets are free and competition is operating. Applying these microeconomic assumptions to long-term growth was the province of factor productivity models, originating with Solow and Swan in 1956. Based on marginal utility theory, each factor of production (capital and labour) contributed to growth according to its marginal productivity. The problem with this factor accounting model was two-fold. First, the nature of ‘capital’ could not be defined or measured – what was it: numbers of different machines or the present value of the interest rate for borrowing ‘capital’? This led to the so-called Cambridge controversy, where the neoclassical school was confounded by those who showed that you needed a common measure of value (labour? ), otherwise the definition of capital was circular (namely its marginal productivity was the rate of interest on borrowing, but the amount of capital was the present value of the rate of interest!). The second problem was that adding up the marginal contributions of capital and labour factors to GDP growth would lead a ‘residual’; which was designated as ‘technical innovation’, the productivity growth of all the factors. This appeared to be ‘exogenous’ i.e. from outside the market system of marginal productivity. Mainstream economics had no explanation for technological innovation! This is where the contribution of Paul Romer comes in. He developed an “endogenous growth model”, where long-run economic growth is determined by forces that are internal to the economic system, namely the ‘knowledge’ incorporated in the workforce of an economy. Technological progress takes place through innovations, in the form of new products, processes and markets, many of which are the result of economic activities. Thus there are constant or increasing returns to factors, not diminishing marginal ones. This theory became popular with many reformist economists and politicians – apparently, former adviser and minister in the British Gordon Brown Labour government, Ed Balls, was a keen promoter. Actually Romer was not the first to come up with this ‘endogenous’ model. That honour goes to the recently deceased Kenneth Arrow, the doyen of neoclassical economics. Arrow recognised what any fool could see: that supply was affected by demand but also demand was affected by supply. Innovation did not come out of the sky but from the drive of companies to grow (or in the case of Marxist theory, to make more profit and reduce labour costs). Of course, the mainstream version of growth theory did not consider profitability relevant to innovation but instead looked at aggregate output. However, the endogenous model is little better (and may be even worse) than the exogenous model in explaining and accounting for long-term growth in economies. Romer argues that the explanation for why some countries grow faster and get richer than others is not more investment in machines, or more labour power and skills; but more ‘ideas’. Whereas the old exogenous model predicted that growth would slow as new investment in skills and capital yielded diminishing returns, Romer’s New Growth Theory opened the window onto a sunnier world view: a larger number of affluent people means more ideas, so prosperity and population expansion might cause growth to speed up. This is nonsense, of course. Capitalism does not work like that. ‘Ideas’ or innovations become the property of individual capitalist companies; IPRs, patents etc are applied. The general distribution of innovation only takes place through the rough and tumble of competition and the battle for profit and market share. Innovation under capitalism depends on profitability and if that is low or not there, or to be given to all, then it won’t be applied. As one critic has pointed out, Romer was very much a profit-making ‘entrepreneur’ himself, having founded and sold on an online economic teaching company – so no open spillover of ‘ideas’ there. In a way, Romer recognises market forces and argues that governments need to intervene to foster technological innovation, for example, by investing in research and development and by writing patent laws that provided sufficient rewards for new ideas without letting inventors permanently monopolize those rewards. Thus we must correct and manage the competitive struggle. Romer is a professor of economics at New York University, but recently he became chief economist at the World Bank for a short and chequered period. It was a surprising appointment for an organisation that is supposed to help poor countries end their poverty. That’s because one of the conclusions that Romer took from his endogenous model of ‘knowledge’ was that developing countries would benefit from creating pockets within urban areas that are administered by a more advanced country, so-called ‘charter cities’. The advanced country would develop a small part of the country by introducing ‘good institutions’ and the benefits of development will spill over into the rest of the economy. Romer’s ideal example was Hong Kong. Rather than seeing Hong Kong’s signing away to Britain as unjust or humiliating for China, Romer saw it as an ‘intervention’ that has done much more to reduce poverty than any aid program and at a much lower cost. Therefore, he concludes that the world needs more Hong Kongs. The whole approach is that a country would gain from giving up sovereignty to a more advanced nation that can better administer its affairs. But has China’s phenomenal growth over the last 40 years, taking 800m people out of World Bank-defined poverty, needed ‘charter cities’ and ‘knowledge’ kindly administered by ‘advanced ‘ economies like the US. Indeed, keeping imperialism out of China is part of the reason for China’s growth success. Romer actually persuaded the government of Madagascar to apply his development plan. It led to massive popular uprisings against the President after he agreed to lease a part of Madagascar to a South Korean corporation for 99 years! Both the long-term growth models of Nordhaus and Romer rest on neoclassical free market theory. As Ben Fine pointed out nearly 20 years ago in his analysis of endogenous growth theory, it has “nothing to do as such with an economy as a whole, other than in the trivial sense of requiring at least two economic agents in order for exchange to arise. Indeed, often implicitly and sometimes explicitly, the literature takes a microeconomic theory and simply interprets it as macroeconomics…In short, endogenous growth theory is heavily implicated in the traditional and strengthening microeconomic foundations of neoclassical economics.” Romer himself has recognised the failure of mainstream economics in his paper The trouble with macroeconomics, In that paper he goes on to trash all macroeconomic models for being unrealistic in their assumptions. Both Nordhaus and Romer start with neoclassical theory and apply it to analyse long-term growth. Their contributions are therefore stunted for that reason. Factor of production models do not explain growth – they leave ‘residuals’ and they cannot account for the nature of ‘capital’ – it’s either just things (machines) or accumulated interest. And there is no connection between these models of growth and the reality of capitalist accumulation for profit and the recurring crises in investment and production in capitalist expansion. Nordhaus and Romer are aware of these contradictions at the heart of capitalism. They know that ‘free markets’ bring pollution and global warming; and ‘markets’ will block innovation if left alone. But their answer is to manage capitalism and try to persuade governments to do so. As the world gets hotter faster, and growth gets slower, good luck with that. This entry was posted on October 9, 2018 at 1:25 pm and is filed under capitalism, economics. You can follow any responses to this entry through the RSS 2.0 feed. You can leave a response, or trackback from your own site. Micheal Roberts skillful analysis of the overlap (or lack of overlap) between the economics view of climate change and IPCC. A must read! A big fat tax on carbon import into the economy – one that is raised until the economy responds by following agreed phase out trajectories could work. If the money collected from the tax goes back to tax payer some 70% would be better off. Read more on the Swedish Sustainable Economy Foundation’s site. Carbon tax is a fraud because, in practice, it is a tool the First World countries begun to use against undeveloped countries to kill any industrialization effort while keeping their own. It is a device to perpetuate hyperconsumism in the Global North and abject misery in the Global South. Correction: carbon credit in the literal translation (I don’t know if in the English language it is the same thing). Not sure climate change can be modelled with any degree of accuracy therefore costed. Global temps are up 1C already at a time when solar output (sunspots) is at a minimum. Nor can we be sure that capitalism will declare a state of economic emergency in time. I compare them to a driver approaching a cliff edge ignoring warning signs until the front wheels are over the cliff, before slamming on the brakes and trying to reverse. By then it is too late. That is why we have to make it one of our main socialist slogans viz. socialism or global environmental catastrophe. Right. Such macro-economic modeling based on such assumptions led Greenspan to drive off a cliff he pretended not to see because of the parachute he carried. The two ignoble laureats’ arguments, as Michael presents them, are in themselves their best critiques. The emperor is naked and so are his apologists. But it seems more like Rome (certainly in the US, land of debt peons and mercenary legions) than St. Petersburg. I like your slogan, but would interpolate: “social insecurity, endless wars, and environmental catastrophe” ….but maybe too heavy to fly as a slogan..
Doesn’t sound like science to me. The carbon tax would take a great deal of work for it to make sense. In it’s current form, it is taxation without any real result. Love the emperor’s new clothes reference. Pretty bang-on. It is hard to believe the author has had any training in economics, Maxist or otherwise. For example, discounting the future has nothing to do with believing lives in the future are less valuable – it is simply a matter of how much invested natural and human resources grow over time. Secondly, it is entirely reasonable to believe that with economic development, people in the future will be much wealthier. (For example, living standards in poor countries are about 10x higher now as 50 years ago.). Thus, in 2100 even (formerly) poor countries will be able to adapt to climate change. (continued…). I one is to believe that poor (and rich) countries will not be wealthier in 2100, you would have to believe that climate change will completely eliminate any economic growth. There is no scientific evidence for that.